Itching is a side effect associated with the administration of an epidural for pain relief. An epidural is pain medication or anesthesia delivered by injection to the spaces that surround the sacs called dura in your spine. Not everyone who has an epidural experiences itching, and the intensity of the sensation varies. As the medication wears off, the itching gradually subsides. Severe discomfort may require treatment to help stop the itching. Apply cool compresses to areas of your body that itch. 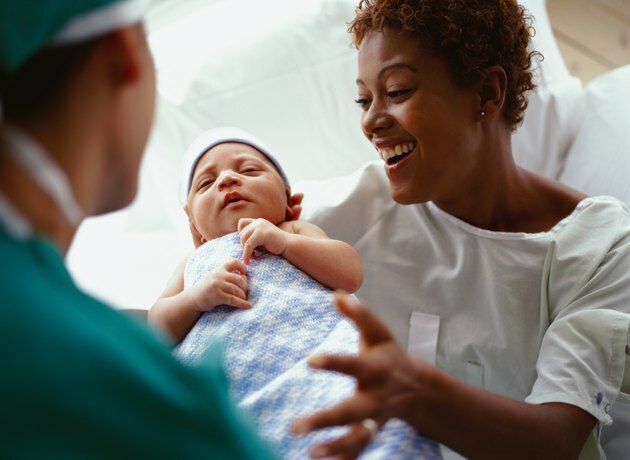 Post-epidural itching usually involves the entire body; choose areas that are especially annoying to treat with cold. The contrast of temperature may relieve enough of the itching that you're less tempted to scratch and break the skin. Wear loose clothing to minimize the itching. Clothing that fits snugly against your skin may make your itching worse, even if the garments are not the original source of the problem. If you've just given birth, change to a clean cotton gown as soon as possible to let air circulate over your skin as the epidural wears off. Ask your medical care provider for medication to stop the itching. Naloxone is a narcotic drug used to counter the effects of other medications and can help resolve the itching caused by epidural medications. Drugs.com explains that nalaxone is administered through a subcutaneous IV line and can be re-administered every few minutes as needed. Adult doses usually range between 0.4 to 2 mg at one time. Enlist friends and family to entertain you, if you're feeling well enough after an epidural, to distract you from the itching. As the medicine wears off, the itching will subside as well. Distractions in the form of conversation, card games or television may help you keep your mind off the discomfort. "Pain"; Itching After Epidural and Spinal Opiates; J. Ballantyne, A. Loach and D. Carr; May 1988. What Are the Treatments for Benzoyl Peroxide Swelling?